Trailblazers, creatives and innovators have taken the Internet to where it is today and made it an essential part of our everyday lives. We have selected a number of interesting “firsts” from the history of the Internet (and the Web) for your reading pleasure. After all, if we can look back on March 10, 1876, when Alexander Graham Bell initiated the first phone call with the words “Mr. Watson, come here, I want to see you,” we can surely have a look back at some more recent events that have shaped our lives. Internet firsts – Notable firsts on the Internet. Web firsts – Notable firsts on the Web. Web service firsts – Firsts for a few notable web services. Ray Tomlinson is credited to having sent the first email back in 1971, and is also famous for having introduced the use of the @-symbol in email addresses to separate the name of the user from the name of the user’s machine. There had been similar systems since the early ‘60s but those had been limited exchanging messages with users on the same mainframe computer, but it wasn’t until 1971 that email started to look like it does today and could send emails over the network. Note that at this time, the Internet didn’t even exist, but its predecessor, ARPANET, did. The first domain name ever registered on the Internet was “symbolics.com”. It was registered on March 15, 1985, by the now-defunct computer manufacturer Symbolics. The first documented spam message was sent out to 393 recipients on ARPANET on May 3, 1978. The message was sent by Gary Thuerk and advertised the availability of a new model of Digital Equipment Corporation (DEC) computers. In other words, Gary Thuerk has the dubious honor of being the world’s first email spammer. It even earned him a spot in the Guinnes Book of World Records. Back in 1978, the term “spam” didn’t yet. 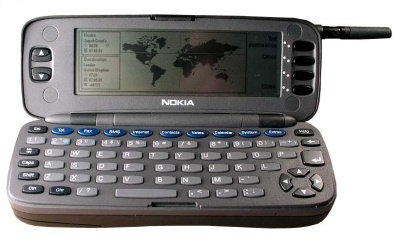 The first mobile phone with Internet connectivity was the Nokia 9000 Communicator. It was launched in Finland back in 1996, but in truth the viability of accessing the Internet was at first limited by very high prices by the operators. In 1999, NTT DoCoMo launched i-Mode in Japan, which is considered the birth of mobile phone Internet services. The first website (in late 1990) was info.cern.ch and ran on a NeXT computer at CERN. The first web page had the address http://info.cern.ch/hypertext/WWW/TheProject.html which contained information about the World Wide Web project. That specific page no longer exists but a later copy from 1992 is available on W3C’s site. Although it’s Amazon and eBay who became really big and famous, they weren’t the first ecommerce sites. Online retailer NetMarket claims to have conducted the first secure retail transaction on the Web. On August 11, 1994, the site sold a copy of the Sting CD Ten Summoner’s Tales for $12.48 plus shipping. Another contender for the crown is the Internet Shopping Network, which claims to have sold an item a whole month earlier. The first financial institution to offer online internet banking services to all of its customers was Stanford Federal Credit Union in October, 1994. Although Internet search engines had been around even before the WWW, they were limited in nature and usually only parsed page titles. The first full-text web search engine (like the ones we have today) was WebCrawler, launched back in 1994. Above: Screenshot from 1996 of Webcrawler.com (via the Internet Archive). Justin Hall started a web-based diary called Justin’s Links from the Underground in 1994. It offered an early guided tour of the Web, but became increasingly personal over time. New York Times Magazine has referred to him as the founding father of personal blogging. Of course, the term “blog” itself wouldn’t be introduced until years later (“weblog” in 1997, which led to “blog” in 1999). Following discussions in October 2000, blogging pioneer Dave Winer added functionality to RSS to include references to audio content inside RSS feeds, making syndication of audioblogging possible. On January 11, 2001, Winer demonstrated the new RSS functionality by enclosing a Grateful Dead song in his Scripting News blog. The last part of the equation, downloading the sound files to an iPod to listen to them, started to gain popularity in 2003. The term “podcasting” for portable listening to audioblogs was introduced in 2004. The first book sold on Amazon.com (which started its service in 1995) was a book by Douglas Hofstadter called Fluid Concepts and Creative Analogies: Computer Models of the Fundamental Mechanisms of Thought. The first YouTube video was uploaded by YouTube cofounder Jawed Karim on April 23, 2005. It’s called “Me at the zoo” and is a video of him at the San Diego Zoo. It has been viewed more than 1.5 million times and is still available on the site. The first tweet recorded (and still existing) on Twitter was Jack Dorsey’s “just setting up my twttr” on March 21, 2006. Jack Dorsey is the man who came up with the idea for Twitter. And no, twttr isn’t a typo. For a short time Twitter was referred to as “twttr”, partly inspired by Flickr, and partly because its five characters could be used as an SMS short code. What an EXCELLENT post! I began my adventures into the Internet in 1995, so I see I really was an early adopter. It’s fascinating to see how rapidly it has grown. I really enjoyed reading this. Thanks! I started using SYP’s (Nordea nowadays) online bank in Finland already in 1993. It only had a telnet interface, but nevertheless, it worked just fine. Before they opened that service to be accessible through telnet it had been available for years through local Minitel clone. Was symbolics.com really the first domain registered, and not until 1985? The domains enea.se and luth.se were the first registered in Sweden, 1983 and 1984 respectively. Apparently, the hierarchical domain name system of today (with top level domains and such) wasn’t in use until 1985, so symbolics.com was the first domain registered in today’s system. However, there were quite a few domains registered in the previous domain name system (such as enea in 1983 and luth in 1984) and those were subsequently converted to the new system. Awesome post. I love Internet history. You can add ‘First Queen to Send an E-mail’ – Queen of England 1976. I definitely think the first webcam (the famous coffee pot) should be on here.